The Door County Half Marathon beings at 10:00 a.m. and is run on paved surfaces in Peninsula State Park. This U.S. Track and Field certified course starts and finishes near Nicolet Beach. The course winds through the park, giving runners breathtaking views of Lake Michigan, shaded areas through the woods, challenging hills and ever-changing scenery throughout one of Wisconsin’s most popular parks. The Nicolet Bay 5k begins at 10:15 a.m., just after the start of the half marathon. The race begins a few hundred yards west of the Half Marathon starting line on Shore Road. Participants will follow the out-and-back course to the Eagle Bluff Lighthouse, where runners will turn around to head back on Shore Road to the finish line. The Nicolet Bay 5k will use the same finish line as the half marathon. The new route for the 5k will make for a cleaner finishing area for both races, allowing nearly all 5k participants to finish before the half marathon runners come through, while providing amazing views of Horseshoe Island, the lake, and the lighthouse. If you are already registered and want to purchase "hotel packet pickup", please select this option. Registration Transfers: We do allow participants to switch races, space permitting, UNTIL APRIL 21. Participants may officially transfer a bib to another person for a $10 fee, but giving your bib to another participant is forbidden and will result in automatic disqualification. The Midwest’s most beautiful half marathon course! Runners can get a free registration to the Door County Half Marathon or Nicolet Bay 5K when they Run for A Cause! Raise $250 for a Door County charity to earn the free registration. Click here to learn more, and email jordan@peninsulapacers.com to get signed up. On Friday, May 3, runners may pick up their packets at the Ephraim Village Hall just north of Wilson’s Restaurant on Hwy 42 from 1 – 9 p.m. (Packet pickup on race day is at Nicolet Bay inside the park). 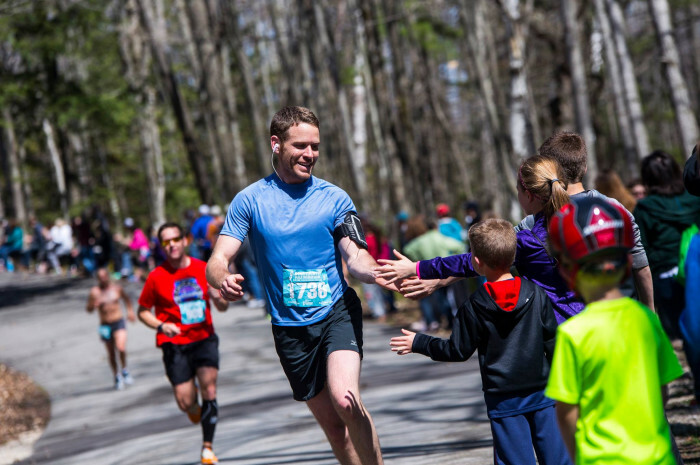 Participants will find Door County Half Marathon gear, race information, park stickers and event passes for parking at Peninsula State Park as well as merchandise from Run Away Shoes of Green Bay. On Race Day, packets may be picked up at Peninsula State Park from 8:00-9:00 a.m. Reminder – parking is limited in Peninsula State Park on race day. Please check the transportation and parking information sections of this site for more information.